Time to visit Asia! After several trips in Europe and America (Traveloque: 117 days abroad) I felt highly motivated to discover the eastern part of the world. Singapore was a perfect destination to get to know the asian culture and discover awesome locations for City Photography in South-East Asia. I was really lucky to have a good friend in Singapore who showed me the whole city. It’s much easier to explore a city with a local guide, especially if you only have five days. He lead me to several traditional food courts, hidden photo spots and teached me a lot about the singaporian history. The following part is a mix of famous photo locations and hidden places, which are hard to find for a foreign Travel Photographer. Take look and enjoy! Marina Bay is the most popular part of Singapore. 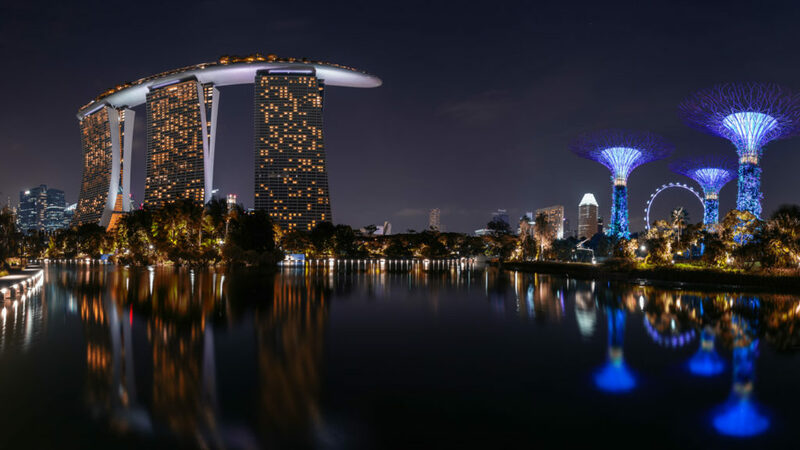 Especially the world famous Marina Bay Sands Hotel is a highlight for tourists from all over the world. Due to this, it’s one of my favorite places for city photography in Singapore. A great spot to picture the hotel is the Helix Bridge. You can find several small platforms on the side of the walkway from where you can easily capture the whole scene. 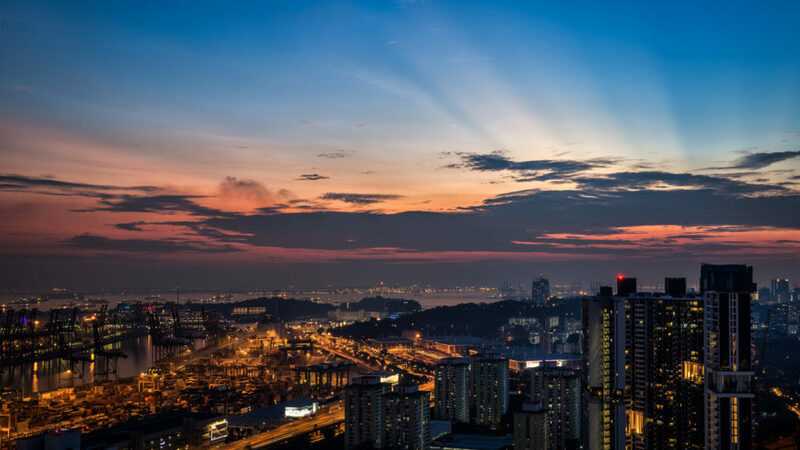 Tip: The lightshow in the evening is the perfect time to get an outstanding portfolio shot! 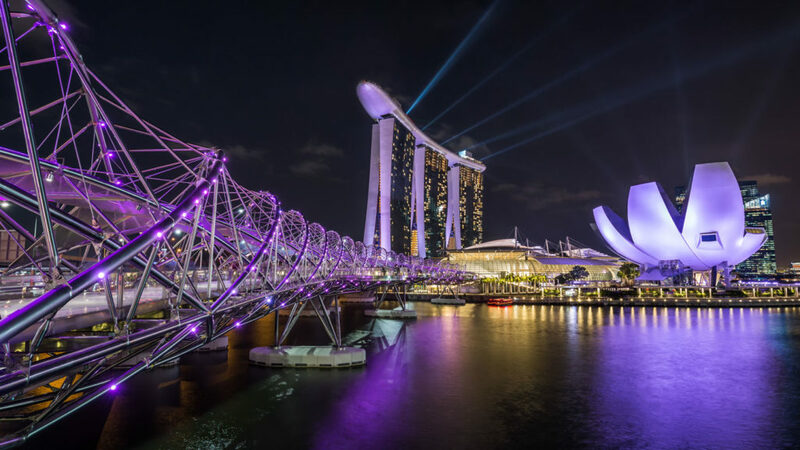 Lightshow: Helix Bridge & Marina Bay Sands Hotel. Another highlight close to the Marina Bay Area is Gardens by the Bay. The park is popular for its illuminated trees and several tropical gardens. I highly recommend to walk around the area at night. Several lightshows start right after sunset and provide a lovely scene for some spectecular photographs. If you get a clear sky, try to get the moon into your picture; perfect to create a mystique atmosphere! 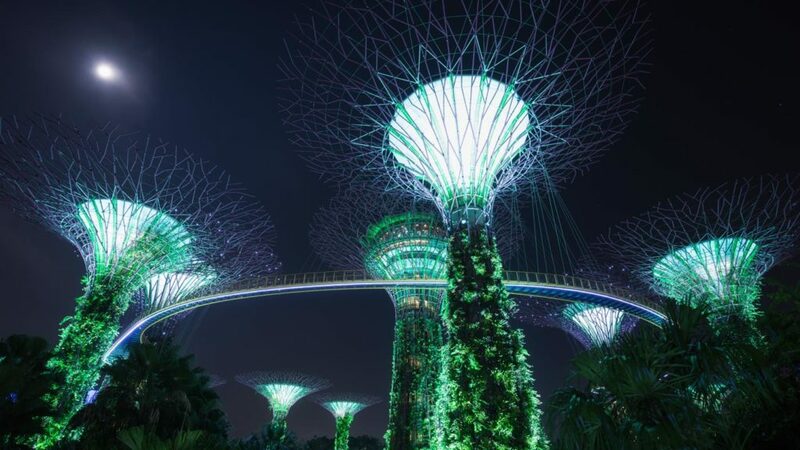 Time for a hidden place in Singapore! Pinnacle@Duxton is a residential development in Singapore’s city center. 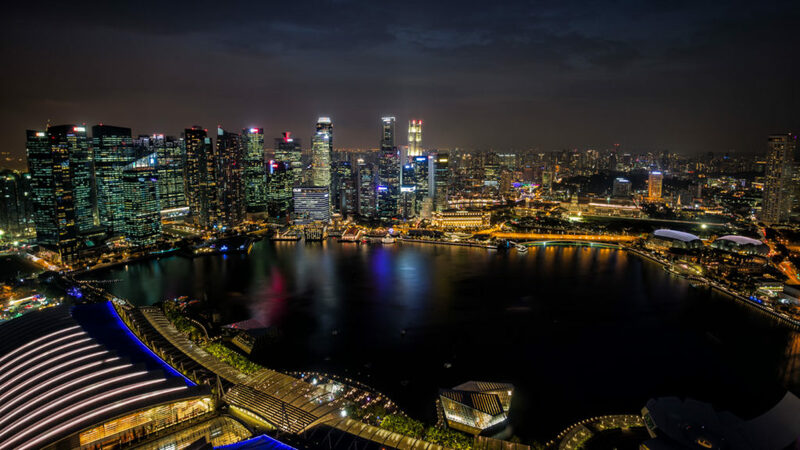 The view from the top offers a great panorama over the harbor and the skyline of Singapore. The access to the top is restricted to local people with a special card for public transport. Due to that, you should try to get your hands on such a card or at least know somebody who can lend you one. Another option to capture the Marina Bay Sands Hotel are the parks next to Gardens by the Bay. If you got a wide angle lense, try to picture the trees and the hotel in one composition. The best place to capture the scene is next to the water. It is really calm and provides perfect conditions for some nice reflections. Tip: Once again, wait until the lights start to glow and enjoy the colorful show! Perfect View: Gardens by the Bay & Marina Bay Sands. Turn around! Most of the photographers focus on the hotel as a main attraction, but the beautiful skyline of the business district is also worth a view. The best photo spot is on top of the Marina Bay Sands Hotel. Get a ticket for the bar and enjoy the view with a free drink. But be careful, they don’t allow tripods up there. Use a beanbag for enough stability and watch the red sun set behind the skyscrapers. Downtown Panorama: On top of Marina Bay Sands. Nice Places for Photography in Singapore. i like your photos and information. You will try to add information which one is best place for Photography. My daughter and her family have planned for a trip to Singapore next week. She just loves to take pictures of the places she travels. I made her read this post. It helped her to know about the various tourist attraction in Singapore and the ways to photograph them. She was happy after reading this and took some truly memorable photos there.